Post a comment on Interchanging Idioms for your chance to win Gravity Radio - to tell us WHY you think this CD is a glimpse at the future of music. 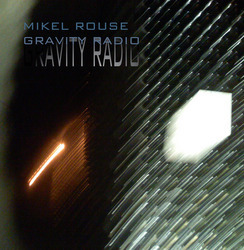 Composer, filmmaker, director and solo performer Mikel Rouse released his new album, Gravity Radio (Exit Music 1012) on Tuesday, November 3 on iTunes and at all major retailers. A live performance of Gravity Radio will tour to New Orleans, New York, Illinois, North Carolina, Toronto, Ireland, and Spain in 2010. However, you can get your copy FREE here at Interchanging Idioms by writing a comment. Gravity Radio features music for string quartet, singers, guitarist, bass, drums and keyboard soaring above and intertwining with ethereal shortwave radio static. Through this texture, a voice (that of Veanne Cox) cuts intermittently with scattershot reports from the AP newswire - stories from the Iraq war, statistics for cell phone usage, plastic surgery, professional football and the economy. The music is immediately familiar and comforting, just as is the text from the newswire feels known and routine. Yet repeated listening generates an odd feeling that perhaps there is more meaning there than first meets the ear. Mikel Rouse has spent his successful and varied career creating music and multimedia projects that marry simplicity and intricacy. Gramophone reports, "We have Rouse's works as living proof that complexity need not keep listeners at a distance, and that pop music can sustain serious interest with the right person at the helm." Mr. Rouse has finely honed his ability to defy genres with his "avant-rock" music, infusing his work with sincere melody while basing it on strict and complex idioms. The result is music that is infectious from the first hearing, and which grows more engaging and cerebral thereafter. Mikel Rouse's musical and theatrical repertoire has its roots in the high art-meets-popular culture of the early '80s downtown Manhattan music and art scene from which he emerged. As the Toronto Globe and Mail puts it, Rouse's music has brought "comparisons to Laurie Anderson, Steve Reich and occasionally Talking Heads, though Rouse's love of complex rhythmic patterns far exceeds them all. But music is just a part of what he does: His pieces also build a hypnotic effect through their non-narrative approach and the use of surreal film images." After the premiere of Rouse's multimedia opera, The End of Cinematics, The New York Times reported, "Sometimes built on heavy, repetitive beats, and sometimes couched in Beatle-esque psychedelia, the songs are vivid, pleasingly visceral and often engagingly harmonized, with amusingly off-kilter lyrics." When you post a comment, send an email to Interchanging Idioms with your name and address (and the comment you posted) so when you win we know where to send your CD.